I had a call today asking if I could appear on my local radio station at 7am on Christmas Eve. Normally, I just say yes to things like this, but in a fit of pique worthy of Scrooge himself, I said it was too early and could manage around 9am. “But the breakfast show finishes at 9”, she said, playing on my spirit of good-will, but to no avail. Half an hour later, she called again offering me a slot on the 10am show instead, which I duly accepted. 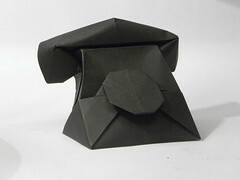 Several of my Facebook friends have expressed disquiet about the concept of origami on the radio. “How could it possibly work?” they cry. Well, it’s difficult, but possible. You need two things; a really simple design with clear location points, plus the ability to describe the folds simply and accurately. I’m not boasting that I have the latter, but it’s fun to try! In the past I’ve always ended with “if you manage to fold it, please send it in to the station”, but I’ve never heard of anyone actually doing this! However, there’s no reason why (in principle) it shouldn’t work. On the BOS website, I added some “over the phone folds” which is essentially the same idea, although without the added pressure of tight programme timing. Give it a go – phone a friend and marvel at your grasp of the English language.